After the protracted and divisive US presidential election, I am craving a strong drink (or two). And while I have usually tried to stay away from bars on Drinksgiving, this year I’m going to spice it up by frequenting some of my favorite Tanteo accounts on Manhattan’s Lower East Side. Here is my itinerary for next Wednesday. Say hello on Instagram and first drink is on me. This bar hidden behind an art gallery is the background for a number of videos our friend Tannaz Hazemi shot a few years ago. Check them out here, here, here, and here . I do not recommend following the same story as Thomas, Andy, Jade, or Juliette; however, indulging in one or two of Fig19’s signature blackberry margaritas is a wise move. Tanteo Jalapeño, lime, agave, and blackberries with a big old ice cube. It gets crowded late at night so I like to start out here early. An actual speakeasy during prohibition, the Backroom keeps its history alive by using teacups in lieu of traditional glassware. I love bringing out of town guests here as it is quite a dramatic place to enter. Their Jalapeño Margarita is always on point, with fresh lime, agave, and Tanteo Jalapeño Tequila - the Tanteo classic at this classic spot. Again it gets quite busy here, so arrive early to secure a seat in the back, and sip the night away. 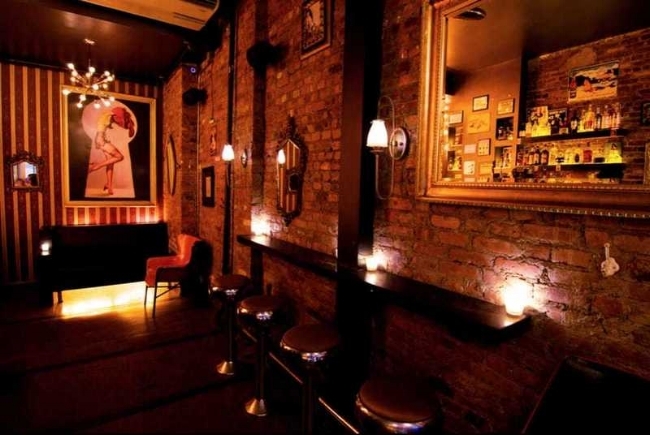 Inspired by the 1950’s pinup culture and right next to the Back Room, Nurse Bettie has great shows and events in addition to great cocktails. The Green Lady incorporates Tanteo, Luxardo Maraschino Liqueur, Green Chartreuse, and even some Absinthe. Heavy on the booze - be careful with this one. fter a few cocktails you probably need a bite to eat. Verlaine serves asian inspired small bits with a number of cocktails, including the Agave, made with our hard to find Tanteo Cocoa Tequila, lime juice, and passionfruit purée. The tartness of the passion fruit works really well with the sweetness of the cocoa tequila, for this very unexpected but a delicious combination. This is the perfect place to end an evening bar crawl. This surfer themed bar off the beaten path is an oasis for locals wanting to get away from the craziness that is a few blocks north. Great fish tacos, their Jalapeño Margarita is made with Tanteo Jalapeño Tequila, lime juice, and agave nectar gives us a lot to be thankful for.